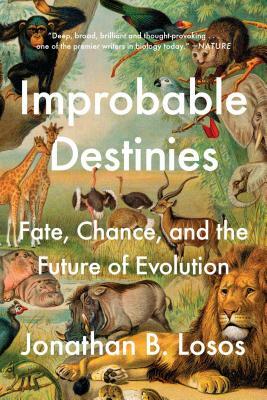 Improbable Destinies will change the way we think and talk about evolution. Losos's insights into natural selection and evolutionary change have far-reaching applications for protecting ecosystems, securing our food supply, and fighting off harmful viruses and bacteria. This compelling narrative offers a new understanding of ourselves and our role in the natural world and the cosmos. Jonathan B. Losos is a biology professor at Washington University and director of the Living Earth Collaborative, a partnership between the university, the Saint Louis Zoo, and the Missouri Botanical Garden. Previously, Losos was a professor of biology at Harvard University and Curator in Herpetology at Harvard’s Museum of Comparative Zoology. Losos is a member of the National Academy of Sciences, the editor in chief of The Princeton Guide to Evolution and How Evolution Shapes Our Lives, and the author of Lizards in an Evolutionary Tree.